Known as the "Riviera of the South", Hermanus is situated on the Cape South Coast, a 90-minute drive from Cape Town which takes one through some of the most beautiful landscapes in the country. The town has been described by Whale expert, Mark Carwardine, as the "Best land based whale watching destination in the world". It is also the only town in the world to have its own whale crier, who alerts visitors and locals alike to the whereabouts of these mammals. Across the bay there's Dyer Island, widely regarded as the best spot in the world to view the Great White shark. Hermanus was also awarded Blue Flag status for the second year in a row which makes it the only beach in the Western Cape to achieve Blue Flag Status for 2003/4. The Blue Flag is a symbol of high environmental standards as well as good sanitary and safety facilities at the beach. The Blue Flag Campaign includes environmental education and information for the public, decision makers and tourism operators. Apart from a multitude of leisure activities and natural attractions waiting to be enjoyed, the town has a wide range of restaurants and shops and hundreds of accommodation establishments to choose from. 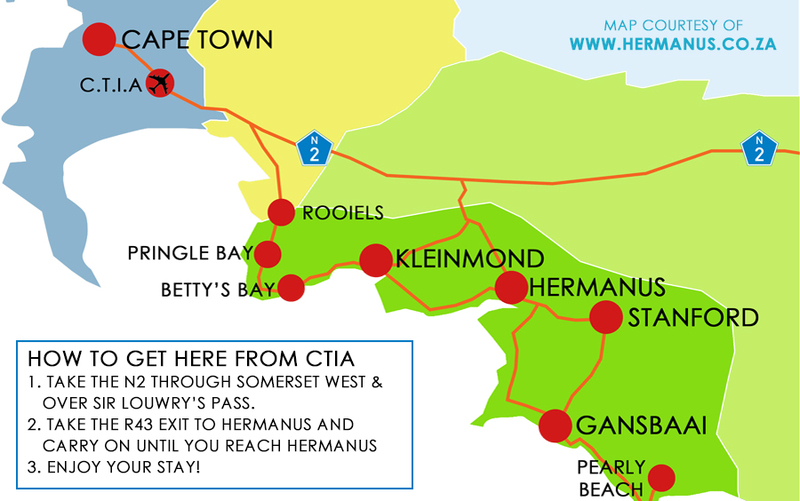 Hermanus is a hiker's paradise, with several options available. Fernkloof Nature Reserve offers unrivalled views for those willing to put a little effort into their walking. The cliff paths, on the other hand, can be enjoyed by all. They trace the coastline of Hermanus from one end to the other, taking about 2 hours to complete.